It seems to be widely accepted in the philosophy of religion community that supposing God's merely compensating a person for evils suffered will not make for a good theodicy. Rather, the evils must be defeated in a way that goes over and beyond compensation, that draws a defeating good out of the evil. I think that in many cases this conviction might well be mistaken. Compensation may well be good enough. You are a financially well-off Olympic archer. You are about to take your last shot at the Olympics, indeed at the last Olympics you will ever compete at (you have promised your spouse to hang up your bow after these Olympics) and whether you get a gold medal depends on this shot. Getting a gold medal means a lot to you. At the same time, you see in the stands a vicious dog attacking me. You could turn your bow on the dog, and painlessly kill it at this range (nor would it be wrong to do so; the dog will be put down anyway after the vicious attack). There is no other way for the attack to be stopped. But then you would lose your last chance for a gold medal: the dog is not the official target. You also know that what kind of a dog it is and how terrified of dogs I am, so that you know that if that were the whole story, the sufferings that I would endure through being bitten are so great that your gold medal wouldn't be worth it: you would have a duty to shoot the dog. But you also know me well enough to know for sure that I would survive the attack without permanent damage, and that you have a sum of money that you could give me such that both by my own lights and objectively I'd be much better off bitten and compensated than neither bitten nor compensated. You resolve to compensate me financially, take your shot at the target, win your gold medal, write me a large check, and we are both much better off for this. Notice what compensation does here. The good you achieve by allowing me to be bitten—the gold medal—is insufficient to justify your permitting me to be bitten. (If this isn't true, we can tweak the case so it is.) But when you add your resolve to compensate me, and your knowledge that the compensation would be sufficient both objectively and by my own lights, you come to be justified. An important feature of this story is that the good you achieve—the gold medal—is one to which my sufferings are not a means, and indeed you do not intend my sufferings either as an end or as a means. (Here one remembers Double Effect, of course.) But there is an end that you are pursuing, and your pursuit of this end precludes your preventing the evil. There are many real-world cases that might well have this structure. Consider Rowe's fawn dying painfully in a forest fire. God could miraculously prevent this, but doesn't, because he wants the laws of nature to have as few exceptions as possible. Now, it's good, I suppose, that the laws of nature have as few exceptions as possible. But this good does not seem to be sufficiently great to justify several days of the fawn suffering. However, if God resolves to compensate the fawn in an afterlife, to a degree such that both objectively and by the fawn's lights (to the extent that the fawn is capable of making the relevant judgments) the fawn will be much better off for having both the suffering and the compensation, then we will have the structure of the archery-dogbite case. I do not know that the compensation story will work for every case. One worry is that if you foreknew that the dog would bite and were responsible for the dog's presence in the stands in the light of this foresight, then the justification in the compensation story is less clear, even if you don't intend the dog's biting. So there will be relevant questions about determinism, Molinism and the like in the theological cases. You are a super-rich archer. You know that sometimes dogs show up and bite people in one area of the stadium. So ahead of time you write sufficiently large checks to all these people such that both objectively and by their lights they would be much better off for having the check and the dogbite than for having neither. And then when it's time to compete, you don't even need to think about the dogs. This seems quite justifiable as well. So if God sufficiently compensates all deer that are in danger of forest fires ahead of time, all is well, too. One common move is to employ theorems to the effect that given some assumptions, measures of simplicity using different languages are going to be asymptotically equivalent. These theorems look roughly like this: if cL is the measure of complexity with respect to language L, then cL(pn)/cM(pn) converges to 1 whenever pn is a sequence of propositions (or bit-strings or situations) such that either the numerator or the denominator goes to infinity. I.e., for sufficiently complex propositions, it doesn't matter which language we choose. Unfortunately, one of the places we want to engage in simplicity reasoning in is with respect to choosing between different candidates for laws of nature. But it may very well turn out that the fundamental laws of physics—and maybe even a number of non-fundamental laws—are sufficiently simple that theorems about asymptotic behavior of complexity measures are of no help at all, since these theorems only tell us that for sufficiently complex cases the choice of language doesn't matter. Simplicity is best understood linguistically (e.g., brevity of expression in the right kind of language). Simplicity is a successful (though fallible) guide to truth. If (1) and (2), then probably the universe was made for language users or by a language user. If the universe was made for language users, it was made by an intelligent being. If the universe was made by a language user, it was made by an intelligent being. So, probably, the universe was made by an intelligent being. Only things that are infinitely more important than me can ultimately ground absolutely overriding rules on me. Rules without ultimate grounding are impossible or not absolutely overriding. I am a finite person. The only things that could be infinitely more important than a finite person are or have among them (a) infinitely many finite persons or (b) an infinite person. Moral rules that apply to me are absolutely overriding. Moral rules that apply to me are not grounded in a plurality including infinitely many finite persons. So, moral rules that apply to me are grounded at least in part in an infinite person. So, there is an infinite person. The vague thought behind (1) is that rules grounded in something merely finitely more important than me will not be absolutely overriding. After all, it is logically possible that I rise in importance by some large finite amount in my life and then exceed the importance of the ground of moral rules if they are grounded in something of merely finite importance. The vague thought behind (2) is that a regress of grounding in effect leaves things ungrounded, and and ungrounded facts can't be that important to me, because it is beings that are important. Premise (3) is plausible. I find (4) quite plausible. It's based on the personalist intuition that persons are the pinnacle of importance in reality. Merely Platonic entities, should there be any, while perhaps beautifully structured and infinite in their own way are not important, not unless they are persons as well. Next, (5) is obvious to me. And (6) seems very plausible. The only plurality of finite persons who could plausibly provide a ground for the moral rules that apply to me is a human community, and there are only finitely many humans. Even if we live in an infinite universe with infinitely many people, the infinitely many aliens surely are not needed to ground the absolute wrongness of degrading a fellow human being. All that said, I am a dubious about (1). I think there are no reasons other than moral reasons, and so the fact that moral reasons take priority over other reasons is a triviality. But even within this controversial framework, I am now realizing there is room to ask the question of why some reasons are absolutely conclusive—they should close deliberation no matter what else has been brought to bear. "But A requires intentionally degrading my neighbor" should close deliberation about A: it doesn't matter what reasons there are for A once it becomes clear that A requires intentionally degrading my neighbor. And that makes something like (1) still plausible. For nothing but a person can be the ultimate ground for a rule whose deliberative importance is so absolutely conclusive—nothing but a person matters enough for this task. Could this person just be my neighbor? Yes—but only if my neighbor is infinitely important, and important in a personal kind of way. This infinite importance can be had in two ways: either my neighbor is an infinite person, or else the infinite importance of my neighbor is derivative from other persons (if it's derivative say from Platonic entities it's not the right kind of importance, for only considerations about persons can bestow the kind of importance that trumps all conflicting considerations about persons). In the latter case we get a regress that is vicious unless there is an infinite person or an infinite number of finite persons grounding the rule. The latter is implausible, so there is an infinite person. This argument requires deontology, of course. Let me end by saying that none of this means I am being pulled to Divine Command Metaethics (DCM). DCM is just one among many ways of grounding morality in an infinite person, and it seems to me to be less plausible than other ways of doing so. Aristotelians think that tensed sentences like "It is sunny" expressed "tensed propositions" capable of changing in truth value between true and false as the facts alter. The proposition that it is sunny is false today but was true two days ago. Anti-Aristotelians, on the other hand, roughly say that the sentence "It is sunny" expresses the proposition that it is sunny at t0, where t0 is the time of utterance, a proposition whose truth value does not vary between true and false as the facts alter. Most presentists are Aristotelians about propositions, and most open futurists these days seem to be presentists. I will argue, however, that an open futurist should not be an Aristotelian about propositions. I think this means that an open futurist should not be a presentist. I will freely put on a pink shirt in one day. According to the anti-Aristotelian open futurist, p is the proposition that I will put on a pink shirt on day d0+1, where d0 is November 14, 2014. The anti-Aristotelian open futurist holds that on November 14, p is not true, but that on November 14 it may become true. So the anti-Aristotelian open futurist has a nice way of accounting for (2). While it's impossible that today p is true, it is possible that p be true tomorrow, and that's enough to make p possible. It is impossible that p ever be true. If it is impossible that p ever be true, then p is not possible. Invoking free will has always been a major part of theodicy. If God has good reason to give us the possibility to act badly, that provides us with at least a defense against the problem of evil. But to make this defense into something more like a theodicy is hard. After all, God can give us such pure characters that even though we can act badly, we are unlikely to do so. I want to propose that we go beyond the mere alternate-possibilities part of free will in giving theodicies. The main advantage of this is that the theodicy may be capable of accomplishing more. But there is also a very nice bonus: our theodicy may then be able to appeal to compatibilists, who are (sadly, I think) a large majority of philosophers. I think we should reflect on the ways in which one can limit a person's freedom through manipulation of the perfectly ordinary sort. Suppose Jane is much more attractive, powerful, knowledgeable and intelligent than Bob, but Jane wants Bob to freely do something. She may even want this for Bob's own sake. Nonetheless, in order not to limit Bob's freedom too much, she needs to limit the resources she uses. Even if she leaves Bob the possibility of acting otherwise, there is the ever-present danger that she is manipulating him in a way that limits his freedom. I think the issue of manipulation is particularly pressing if what Jane wants Bob to do is to love her back. To make use of vastly greater attractiveness, power, knowledge and intelligence in order to secure the reciprocation of love is to risk being a super-stalker, someone who uses her knowledge of the secret springs of Bob's motivations in order to subtly manipulate him to love her back. Jane needs to limit what she does. She may need to make herself less attractive to Bob in order not to swamp his freedom. She may need to give him a lot of time away from herself. She might have reason not to make it be clear to him that she is doing so much for him that he cannot but love her back. These limitations are particularly plausible in the case where the love Jane seeks to have reciprocated is something like friendship or, especially, romantic love. And Scripture also presents God's love for his people as akin to marital love, in addition to being akin to parental love (presumably, God's love has no perfect analogue among human loves). So if God wants the best kind of reciprocation of his love, perhaps he can be subtle, but not too subtle. He can make use of his knowledge of our motivations and beliefs, but not too much such knowledge. He can give us gifts, but not overload us with gifts. He may need to hide himself from us for a time. Yes, the Holy Spirit can work in the heart all the time, but the work needs to be done in a way that builds on nature if God is to achieve the best kind of reciprocation of his love. I think there are elements of theodicy here. And a nice bonus is that they don't rely on incompatibilism. A grad student was thinking that Platonism isn't dominant in philosophy, so I looked at the PhilPapers survey and indeed a plurality of the target faculty (39%) accepts or leans towards Platonism. Then I got to looking at how this works across various specializations: General Philosophy of Science, Philosophy of Mind, Normative Ethics, Metaethics, Philosophy of Religion, Epistemology, Metaphysics, Logic / Philosophy of Logic and Philosophy of Mathematics. And I looked at some other views: libertarianism (about free will), theism, non-physicalism about mind, and the A-theory of time. Loosely, the five views I looked at are "metaphysical" in nature and their denials tend to be deflationary of metaphysics. I will say that someone is "metaphysical" to the extent that she answers all five questions in the positive (either outright or leaning). We can then compute a Metaphysicality Index for an individual, as the percentage of "metaphysical" answers, and then an average Metaphysicality Index per discipline. Here's what I found. (The spreadsheet is here.) I sorted my selected M&E specialities from least to most metaphysical in the graph. On each of the five questions, the Philosophers of Science were the least metaphysical. This is quite a remarkably un-metaphysical approach. Unsurprisingly, the Metaphysicians came out pretty metaphysical, though not as metaphysical as the Philosophers of Religion. (And this isn't just because the Philosophers of Religion believe in God by a large majority: even if one drops theism from the Metaphysicality Index, the Philosophers of Religion are at the top. 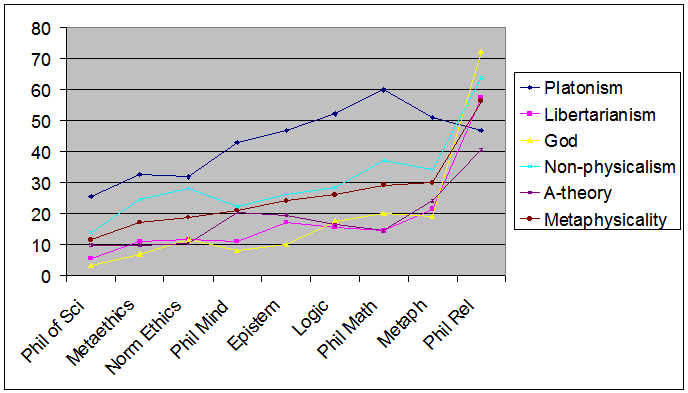 Interestingly, the Philosophers of Mathematics were almost as metaphysical as the Metaphysicians (average Metaphysicality Index 29.2 vs. 29.8). They were far more Platonic than anybody else. I wonder if Platonism is to Philosophy of Mathematics like Theism is to Philosophy of Religion. The Philosophers of Mathematics were also more theistic and more non-physicalistic than any group other than the Philosophers of Religion. It's looking to me like the two fields where Platonism is most prevalent are Logic (and Philosophy of Logic) and Philosophy of Mathematics. This is interesting and significant. It suggests that on the whole people do not think one can do mathematics and logic in a nominalist setting. For the record, here's where I stand: Platonism: no; Libertarianism: yes; God: yes; Non-physicalism: yes; A-theory: no. So my Metaphysicality Index is 60%. According to presentism, events come out of nothing (the future), have a flash of reality as they are briefly present, and then pass back into nothing (the past). But nothing comes out of nothing. So, it seems, presentism is false. I wonder if the above argument equivocates on "comes out of nothing". Suppose that God made physical stuff (say, particles) be arranged just like in a butterfly, but he did not give (either directly or by some general policy) a butterfly form. Then we would have something that looks just like a butterfly. And to the extent that butterfly behavior is ultimately predictable just from physics, that bunch of physical stuff would behave like a butterfly. There wouldn't be a butterfly there. In fact, there wouldn't be one thing there: just a bunch of physical stuff. God created a physical world and had some chemical stuff come together in a way that "reproduced". And then evolution took over, and bundles of physical stuff that were better at survival and reproduction reproduced more, until we had bundles of physical stuff shaped like algae, trilobites, trees, dinosaurs, birds, horses and apes. But there never were any algae, trilobites, trees, dinosaurs, birds, horses or apes. Finally, not too long ago on a cosmic scale, there came to be two bundles of physical stuff that were physically rather like humans. By this point, there was no physical stuff shaped like trilobites or dinosaurs, but there was physical stuff shaped like algae, trees, birds, horses and apes. And God then said: "Let there be algae, trees, birds, horses, apes and many other organisms", and he created forms which informed the algaelike, treelike, birdlike, horselike and apelike bundles of physical stuff, and all sorts of other bundles. Thereupon, there were birds, horses and apes, though things didn't look any different. Finally God said: "Let there be humans", and he created forms which informed the human-like bundles of physical stuff. And there were humans. This story is fully compatible with naturalistic evolution. Indeed, the only bar to the possibility of this story would be a vitalism on which physical stuff does not behave like living organisms. On this story, there literally never have been any dinosaurs. But there will have been bundles of physical stuff arranged dinosaurwise, and that's all many a biologist thinks a dinosaur is anyway. When God created the forms of all the organisms, he miraculously arranged things so that no organism would suffer, miraculously making a harmonious state. And he put humans in charge of this delicately balanced system. Humans, however, quickly came to freely reject God's sovereignty in the system that he put them in charge of, and he reluctantly removed his miraculous protection from the system in deference to the authority he granted humans. And so humans and other animals came to suffer. The main reason I don't like this story has to be with my being an eternalist. I think past (and future) objects are real. And I think reality will be more wonderful if it really contains trilobites and dinosaurs, not just physical stuff arranged trilobitewise or dinosaurwise. So while the above story is basically logically possible, I don't think it's actually true, because it seems likely that a God whose goodness spreads itself out creatively would be likely to create forms for physical stuff arranged trilobitewise and dinosaurwise. But there might, nonetheless, be aspects of the story that we can adopt. In the story, creation was safeguarded by God's taking bundles of physical stuff and giving them form. We can posit this in a more commonsensical evolutionary story. Maybe the gametes of two dinosaur parents involve some mutation that makes the offspring be particularly birdlike. Then God can simply prevent the offspring from being informed by a dinosaur form and then instead make the offspring be informed by a bird form. This is still direct creation of birds from previously existing physical matter. And while higher animals prior to the first human sin were conscious, we can suppose that God in his love miraculously prevented any instance of conscious suffering that wouldn't be on balance good for the animals, say by miraculously preventing pain qualia or in some other way. But this divine miraculous intervention perhaps ended (though perhaps not!) when Adam and Eve rejected God's rule over the earth they were put in charge of. 1. A moral saint can respond in a saintly way to everything the wicked can do to her. 2. If there is no afterlife, then a moral saint cannot respond in a saintly way to being instantly murdered. 3. The wicked can murder the moral saint. 4. So, there is an afterlife. If we have abundant properties in our ontology, do we need to posit a second kind of entities, the sets? Properties are kind of like sets. If P is a property, write x∈P if and only if x has P. A whole bunch of the Zermelo-Fraenkel axioms then are quite plausible. But not all. The most glaring failure is extensionality. The property of being human and the property of being a member of a globally dominant primate species have the same instances, but are not the same property. If R is any symmetric and transitive relation, then there is a property P such that (a) if x has P, then x stands in R to itself, and (b) for all x if x stands in R to itself, there exists a unique y such that x stands in R to y and y has P.
Like the ordinary Axiom of Choice, this is a kind of principle of plenitude. Apply (1) to the relation C of coextensionality that holds between two properties if and only if they have the same instances. This generates a property S1 that is had only by properties and is such that for any property P there exists exactly one property Q such that P and Q are coextensive and Q has S1. In other words, S1 selects a unique property coextensive with a given property. To a first approximation, then, we can think of those entities that have S1 as sets. Then every set is a property, but not every property is a set. We certainly have extensionality, with the usual restriction to allow for urelements (i.e., extensionality only applies to sets). All the other axioms of Zermelo-Fraenkel with urelements minus Separation, Foundation and Choice are pretty plausibly true (they follow from plausible analogues for properties on an abundant view of properties). We get Choice for sets for free from (1). Unfortunately, we cannot have Separation, however. For the property S1 is coextensive to some set U by our assumptions. And the members of U will just be the instances of S1, i.e., all the sets. And so we have a universal set, and of course a universal set plus Separation implies Comprehension, and hence the Russell Paradox. So matters aren't so easy. The Axiom of Foundation is also not so clear. Might there not be a self-instancing property? There is a property S2 of properties such that (a) concreteness has S2, and (b) all the axioms of Zermelo-Fraenkel Set Theory with Urelements minus Extensionality are satisfied when we stipulate that (i) a set is anything that has S2 and (ii) A∈B if and only if A is an instance of B. This axiom is fairly plausible, I think. Now suppose that S1 is as before, and let S2 be any property satisfying (2). Then let S be the conjunction of S1 and S2. It is easy to see that if we take our sets to be those properties that have S, we will have all of Zermelo-Fraenkel with Choice and Urelements (ZFCU). Or at least so it seems to me—I haven't written out formal proofs, and maybe I need some further plausible assumptions about what abundant properties are like. Of course, we cannot expect S1 and S2 to be unique. So there will be multiple candidates for sets. That's fine with me. The big question is whether (1) and (2) are true. But if the theoretical utility of positing sets is a reason to think sets exist, then theoretical utility plus parsimony plus the reasons to believe in properties are a reason to think (1) and (2) are true. Does a fetus have basically the same intrinsic moral standing as a normal newborn baby? Does the life of members of the human biological species begins at or around conception? (In some cases, (1) will need to be qualified to: "fetus with brain states", and then the following discussion will need to be restricted to somewhat later abortions.) Of course, the pro-choice and pro-life philosophers disagree on the implications of these positive answers. Thus, pro-choice philosophers who give a positive answer to (1) will either say that killing a normal newborn is permissible or that it is wrong for reasons other than its intrinsic moral standing (e.g., the hurt to adults in our society). And pro-choice philosophers working on abortion tend to distinguish between us and members of our biological species, holding that we are constituted by and not identical with members of our biological species. If the answers to (1) and (2) are positive, then abortion is at least typically impermissible. If so, then the position of lay pro-choicers is apt to be unstable. It is predicated at least in part on negative answers to (1) and (2), whereas the relevant experts—philosophers working on abortion, whether pro-choice or pro-life—tend to agree that the answers are positive. Like I said, these are just anecdotal impressions. It would be valuable to have research on both lay and philosophical pro-choicers to see if these impressions are correct or not. Suppose it turns out that my anecdotal impressions turn out to be correct. Then the disconnect between lay and philosophical pro-choicers suggests that even if the philosophical debate is at a stalemate, there are ways for the social debate to move. A number of my posts are exercises in philosophical imagination rather than serious philosophical theories. These exercises can have several benefits, including: (a) they're fun, (b) they expand the range of possibilities to think about and thus might contribute to a new and actually promising approach, and (c) they potentially contribute to philosophical humility by making us question whether the views that we take more seriously are actually better supported than these. This is one of those posts. Suppose that time is discrete and made up of instants. However instead of saying that always some instant is present, we now allow for two possibilities. Sometimes an instant is present. But sometimes presently we are between instants. When an instant is present, there is a present moment. When an instant is not present, when we are between instants, there is a present interval, bounded by the last past instant and the first future instant. uses the implicit assumption that we are always at an instant. But if sometimes instead of being at an instant we are between them, we are at an interval, then the inference fails. And indeed when instead of a present moment we have a present interval, we can say that the arrow really is moving in the present—it is in two places in the present, in one place in the last past instant and in another in the first future instant. So we have positions when an instant is present and velocities when an interval is present. Of course there are other ways out of the Zeno paradox of the arrow, the best of which is to adopt the at-at theory of motion. But it's nice to have other solutions besides the usual ones. I'm going to start by offering a simple way—likely not original, but even if so, not very widely discussed—of turning an indeterministic physical theory into a deterministic physical theory with an indeterministic dualist metaphysics. While I do not claim, and indeed rather doubt, that the result correctly describes our world, the availability of this theory has some rather interesting implications for the mind-body and free will and determinism debates. Start with any indeterministic theory that we can diagram as a branching structure. The first diagram illustrates such a theory. The fat red line is how things go. The thin black dotted lines are how things might have gone but didn't. 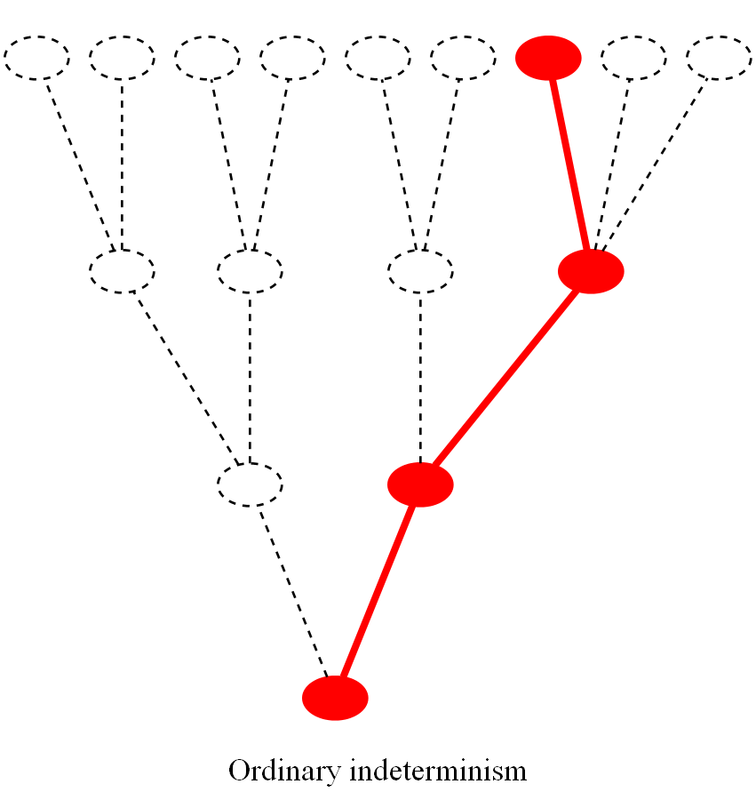 At each node, things might go one way or another, and presumably the theory specifies the transition probabilities—the chances of going into the different branches. The distinction between the selected branches and the unselected branches is that between the actual and the merely possible. The Everett many-worlds interpretation of Quantum Mechanics then provides us with a way of making an indeterministic theory deterministic. We simply suppose that all the branches are selected. When we get to a node, the world splits, and so do we its observers. All the lines are now fat and red: they are all taken. There are some rather serious probabilistic problems with the Everett interpretation—it works best if the probabilities of each branch coming out of a node are equal, but in general we would not expect this to be true. Also, there are serious ethics problems, since we don't get to affect the overall lot of humankind—no matter which branch we ourselves take, there will be misery on some equally real branches and happiness on others, and we can do nothing about that. To solve the probabilistic problems, people introduce the many-minds interpretation of the many-worlds interpretation. Each person has infinitely many minds. When we get to a branch point, each mind indeterministically "chooses" (i.e., is selected to) an outgoing branch according to the probabilities in the physics. 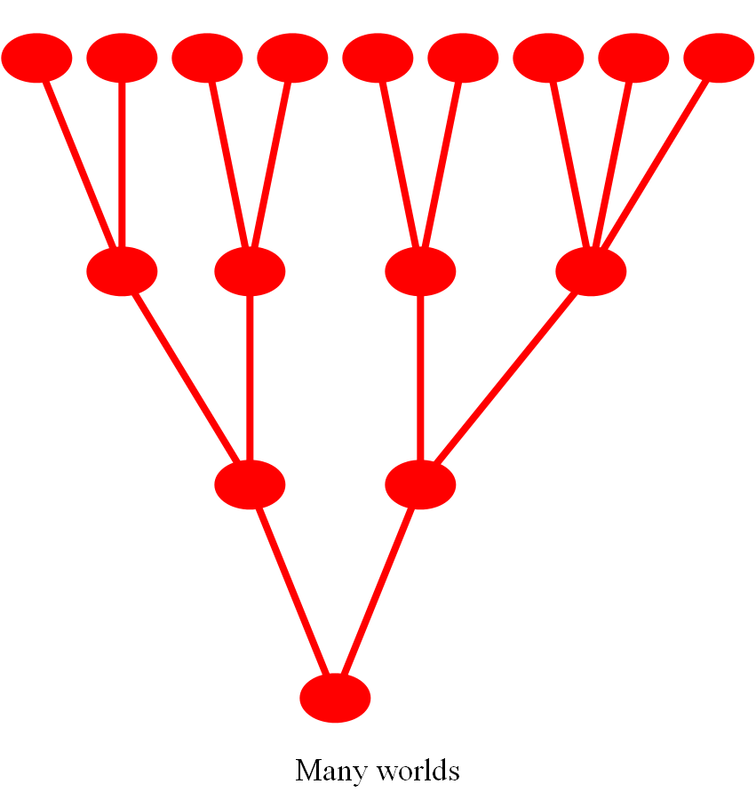 Since there are infinitely many of these minds, at least in the case where there are finitely many branches coming out of a node we will expect each outgoing branch to get infinitely many of the minds going along it. So we're still splitting, and we still have the ethics problems since we don't get to affect the overall lot of humankind—or even of ourselves (no matter which branch we go on, infinitely many of our minds will be miserable and infinitely many will be happy). But now I want to offer a traveling minds interpretation of the indeterministic theory. On the physical side, this interpretation is just like the many-worlds interpretation. It is a dualist interpretation like the many-minds one: we each have a non-physical mind. But there is only one mind per person, as per common sense, and minds never split. Moreover our minds are all stuck together: they always travel together. When we come to a branching point, the physical world splits just as on the many-worlds interpretation. But the minds now collectively travel together on one of the outgoing branches, with the probability of the minds taking a branch being given by the indeterministic theory. In the diagram, the red lines indicate physical reality. So unlike in the original indeterministic theory, and like in the many worlds interpretation, all the branches are physically real. But the thick red lines and the filled-in nodes, indicate the observed branches, the ones with the minds. (Of course, if God exists, he observes all the branches, but here I am only talking of the embodied observers.) On the many-worlds interpretation, all the relevant branches were not only physically real, but also observed. Presumably, many of the unobserved branches have zombies: they have an underlying physical reality that is very much like the physical reality we observe, but there are no minds. Traveling Minds helps a lot with the ethics problem that many-worlds and many-minds faced. 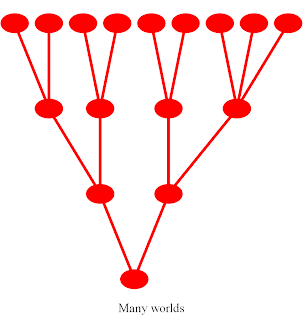 For although physical reality is deterministically set, it is not set which part of physical reality is connected with the minds. We cannot affect what physical reality is like, but we can affect which part of physical reality we collectively experience. And that's all we need. Note that "we" here will include all the conscious animals as well: their minds are traveling as well. In fact, as a Thomist, I would be inclined to more generally make this a "traveling forms" theory. Thus the unselected branches not only have zombies, but they have physical arrangements like those of a tree, but it's not a tree but just an arrangement of fields or particles because it lacks metaphysical form. But in the following I won't assume this enhanced version of the theory. Now while I don't endorse this theory or interpretation—I don't know if it can be made to fit with hylomorphic metaphysics—I do want to note that it opens an area of logical space that I think a lot of people haven't thought about. Traveling minds is an epiphenomenalist theory (no mind-to-physics causation) with physical determinism, and is as compatible with the causal closure of the physical as any physicalist theory (it may be that physicalist theories themselves require a First Cause; if so, then so will the traveling minds theory). Nonetheless, it is a theory that allows for fairly robust alternate possibilities freedom. While you cannot affect what physical reality is like, you can affect what part of physical reality we collectively inhabit, and that's almost as good. We have a solution to the mind-to-world causation problem for dualism (not that I think it's an important problem metaphysically speaking). I expect that I and other philosophers have incautiously said many things about things like epiphenomenalism, determinism and causal closure that the traveling minds theory provides a counterexample to. For instance, while traveling minds is a version of epiphenomenalism, it is largely untouched by the standard objections to epiphenomenalism. For instance, one of the major arguments against epiphenomenalism is that if minds make no causal difference, then I have no reason to think you have a mind, since your mind makes no impact on my observations. But this argument fails because it assumes incorrectly that the only way for your mind to make an impact on my observations is by affecting physical reality. But your mind can also make an impact on my observations by leaving physical reality unchanged, and simply affecting which part of physical reality we are all collectively hooked up to. I used to worry for Aristotelian reasons about the particles making up my body. The worry went something like this: Elementary particles are fundamental entities. Fundamental entities are substances. But no substance has substances as parts. The last is, of course, a very controversial bit. However there are good Aristotelian reasons for it. But I shouldn't have worried much. Elementary particles are not all that likely to be fundamental entities. Quantum mechanics, after all, allows all sorts of superpositions between different particles. But substances either simply exist or simply don't. In the superposition case, they don't simply exist. So they simply don't. But I would expect that the superposition case is more the rule than the exception (if only with small coefficients for all but one one state). I guess we could think that when the wavefunction is in a pure state with respect to the existence of a particle, the particle then pops into existence, and when the state becomes mixed, it pops right out. But notice that the physics behaves in much the same way when we have a pure state and when we have a mixed state that is to a very high approximation pure. So whatever explanatory role the particles play when they pop into existence can be played, it seems, by the wavefunction itself when the particles aren't around. This suggests that the wavefunction is the more explanatorily fundamental entity, not the particles. Of course, the above relies on denying the Bohmian interpretation of quantum mechanics. But it's enough, nonetheless, to establish that elementary particles aren't all that likely to be fundamental entities. And hence they aren't all that likely to be substances. The simplest way to run an infinite fair lottery? I've posted two ways to run an infinite fair lottery (this and this). There is also a very simple way. Just take infinitely many people and have them each independently toss an indeterministic fair coin. If you're lucky enough that exactly one person rolls heads, that's the winner. Otherwise, the lottery counts as a failure. The probability of failure is high—it's one—but nonetheless success should be causally possible. And if you succeed, you've got what is intuitively an infinite fair lottery. My earlier thought experiments requires a version of the Axiom of Choice. This version doesn't, but the earlier ones has the merit of working always or almost always. However, for the purposes of generating paradoxes and supporting causal finitism this version might be good enough. A note to fellow mathematicians: Any mathematician reading this and some of my other posts on infinite fair lotteries is apt to be frustrated. There is a lot that isn't rigorous here. But I'm not doing mathematics. One can perhaps best think of what I'm doing as a physicsy thought experiment. When I think of independent indeterministic coin flips, take these as actual causally-independent physical processes, e.g., each indeterministic coin flip happening in a different island universe of an infinite multiverse. I am fully aware, for instance, that the stuff I say in this post isn't fully modeled by the standard Kolmogorovian probability theory. For instance, an infinite sequence of i.i.d.r.v. 's Xn with P(Xn=1)=P(Xn=0)=1/2 need not have any possible state such that exactly one of the variables is 1, depending on how the i.i.d.r.v. 's are constructed. That's an artifact of the fact that probabilistic independence as normally defined is not a sufficient model of genuine causal independence (see here). I am also assuming that permutation symmetries in the space of coin flips persist even when we consider nonmeasurable or null sets. Again that's going beyond the mathematics, but justified as a physicsy thought experiment. If we put each coin flip in a relevantly similar separate universe of a multiverse, then of course everything should be intuitively invariant under permutations of the coins. Probabilities understood vaguely as measures of rational believability go beyond the mathematical theory of probability.